Pictured with and without leg extensions. One (1) 30,000 BTU cast-aluminum, rust resistant burner is perfect for cooking in soup, chili, and other items that need to simmer, sauté, and steam. This UL approved low output, low pressure system arrives equipped with a regulator and 3 ft. hose and weighs 14 lbs. making it ideal for transporting from one event to another. The sturdy, durable frame gives each chef the option to operate the unit on a table-top (12” tall) or have it free standing using the included leg extensions (24” tall). 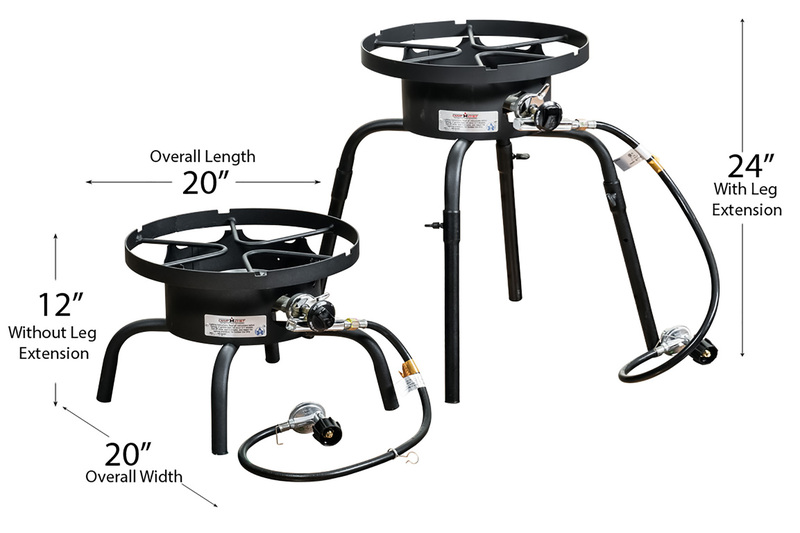 With a 15” diameter surface, the heat from the burner is evenly distributed over the bottom of the pot for efficient heat retention and recovery. • Total weight of SL30L is 14 lbs.